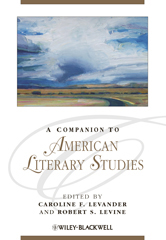 Editor/Author Levander, Caroline F. and Levine, Robert S.
A Companion to American Literary Studies addresses the most provocative questions, subjects, and issues animating the field. Essays provide readers with the knowledge and conceptual tools for understanding American literary studies as it is practiced today, and chart new directions for the future of the subject. A unique anthology in the field, and an essential resource for libraries, faculty, graduate students, and advanced undergraduates.